Editor’s Note: Following San Luis Obispo Councilman Dan Carpenter proposing rapid re-housing for the homeless and a rehab of the current homeless shelter John Spatafore, Sandee Menge, Paul Wolff and Councilman John Ashbaugh voiced their support of a large propose homeless center in the Tribune. Please consider this a reply to your May 18th viewpoint in The Tribune, and know that I speak straight from my heart. I am a fifty year resident of SLO and long-time advocate for un-housed people. For many years, I worked with those who were ineligible for homeless services, referred them to agencies who could help, and provided food, clothing, and sleeping bags to those unable to get their own. Hearing firsthand how so many un-housed people were being banned from utilizing local homeless services, we founded Hope’s Village of SLO. We are a 501(c)(3) public charity California corporation with an outstanding board of directors and team of volunteers dedicated to opening a sustainable community village for local un-housed adults in the near future. Our site will be on ten acres of permanent land outside SLO City limits and will operate under an organized group camp permit authorized by the Environmental Health Department. It will serve as a model for the rest of the state and nation. Every one of the villagers will work to help build the common house and tiny cabins; they’ll help maintain the village, and earn their keep. We are convinced that we are a nation addicted to welfare – when you give people something for nothing, they don’t learn how to do, they learn how to take. You may have read about HV in the papers, seen it on TV, or heard us on the radio. Through our “RV’s for Veterans” program, we have connected donors of 25 RV’s with local homeless veterans – no money exchanges hands. More of our un-housed veterans are now out of the bushes, off the streets and in their own safe homes on wheels. We’ve received calls from all over the country about the program. It’s simple and successful – watch for more “RV’s for Veterans” programs popping up. * We hear conflicting stories about actual housing through case management. Could you please provide us with statistics regarding exactly how many people have been housed through case management, and of those housed, what is their retention rate? * We have heard from homeless services staff that it takes approximately 18 months to get a homeless person into (transitional or permanent) housing. Can you please verify? *I have had personal discussions with three homeless veterans who live in the creek that they have been promised housing for years from case management, but it has not come through; They know who their case workers are – why have these men (and so many others like them) not received housing? * You list several providers in your viewpoint where ‘housing comes first;’ doesn’t TMHA offer mostly temporary/transitional housing? We know People’s Self-Help Housing is for those who have good income and can make the mortgage payments; the SLO Housing Authority tends to house several people in one apartment – something most veterans cannot handle with various mental issues; the local Veterans’ Service Office on Grand Avenue provides VASH vouchers to homeless veterans, but some are unable to locate housing and therefore, they refer veterans to us that they cannot assist; isn’t most of the housing provided in SLO to homeless people considered transitional and thus temporary? * We see ads in The Tribune each week asking for peanut butter, coffee, towels, etc. for Prado and MLM; if these needs can’t be filled now, how will these needs be taken care of with a new bigger shelter? Isn’t it “unrealistic” to expect donors in the community to keep providing these basic items? * We’ve all heard different monetary figures for the building and maintenance of the new shelter — that it will cost approximately $1,000,000 a year to run — where will this money come from? * We live in the ‘real world.’ We know that many homeless people cannot “move toward self-sufficiency…” which is a big part of CAPSLO/Prado/MLM’s mission. Many homeless neighbors of ours will never fit into ‘normal’ society – perhaps they never did. They will never have a nine to five job, nor get large enough raises in their Social Security or disability incomes allowing them to cover rent and other living expenses. Not everyone belongs on aid. Who will help these people into housing? *As of June 1, people who try to access shelter/food/water/showers/phone use/laundry privileges, bus passes, etc. at Prado/MLM and have been using or drinking (and cannot seem to stop) will be unable to use the shelters. Where will these people go? Who will help them get into housing? *If the new shelter is “the right thing to do,” why aren’t other towns building big new shelters? HUD, the National Law Center on Homelessness and Poverty, the National Coalition for Homeless and dozens of other organizations’ studies all point to housing first, not shelter first. * We’ve seen our federal government shut down twice in the past 13 years. How much longer do you they will be able to bankroll efforts to ‘end/reduce homelessness’ when as of 5:00am this morning, our national debt is $17 trillion and rising? * And this fact, of course, begs the question: Is it really the government’s responsibility to provide housing for everyone? * I see no mention of the new homeless services center in the “Ten Year Plan to End Homelessness” — could you please point to page and paragraph where new service center is mentioned? * You state in your viewpoint that it’s unrealistic to expect the faith based community to help. I was told by one long-time local pastor that upon opening, he had to sign an agreement with the City of SLO promising to not allow homeless people to park their RV’s in the church’s parking lot. Is this true? * It is common knowledge that shelters are Band-Aids – revolving doors. The same people in and out. How will the new center be different? * This new shelter will provide job security for many local career folks, and some careers in this region are based on the status quo. This may be a crude thought, but are we thinking about the homeless here, or about others who will make their living off the homeless? * If you build a big new service center, we all know that homeless people from other areas will come. Will you be able to prevent this? * Since the new service center will be partially funded by government grants, will you be able to give priority to local homeless people, or will you have to allow everyone to utilize the center regardless of their city of origin? * Currently, the only soup kitchen in SLO is the People’s Kitchen at Prado/MLM. We’ve heard talk about relocating the kitchen so all homeless people have access (at least) to food. Is this true? * If you’ve been banned from utilizing Prado/MLM, your option to eat is to come to the gate between 11 a.m. and 11:15 a.m. to get a ‘sack lunch.’ (It’s a worry to us because many times, people don’t even have bus fare to get to Prado from where they are trying to be invisible from local law enforcement and thus get sleep). Is this still the case, and if so, will this plan change with the new service center? * How many volunteers do you think it will take to cover the needs of a big new service center when the number of SLO’s homeless increases? * I’ve worked as a volunteer at Prado – watched people come in, sign in, get their coffee and go outside to smoke. Will the new service center be different/better? * If your child, sister, mother or grandfather or any family member fell on hard times and for whatever reason became homeless, would you want her in a shelter with 100 other homeless people or in her own tiny home (among others in their tiny homes) with personal space – all watching out for each other and working hard to regain their self-pride and dignity? * According to your Viewpoint, the new service center will “fulfill vital needs” of those it deems eligible to participate. Past practices have seen people banned from the shelter for name calling (to staff or even to another client); for slamming down a receiver in the phone base upon hearing very upsetting news; for a homeless man who parked in the director’s spot just long enough to pick up a fellow homeless person; for carrying a plate of food outside the dining area, for yelling and swearing (a woman who is bipolar and has a dual diagnosis, was accused by staff of “not taking her meds” when, in fact, she needed new meds. The on-call psychiatrist at Mental Health, where she ended up for three days, prescribed new meds for her. Today she is safe, well, and acing her college classes – after being banned from Prado). Since we all know that many homeless suffer a variety of mental health issues, why would staff ban these people forcing them out with no access to water, food, shelter, laundry/phone/mail service? Because they can’t handle them? We are told that the reason is because there are not enough staff to care for the numbers of homeless people they are trying to help now. What will happen when the numbers increase? * Finally, whose needs will be fulfilled by the new service center? People within your own group have different opinions than the ones stated above. Please – get together and talk. Be open and honest with each other. Have the courage and compassion that Dan Carpenter has to speak his mind and not go along with the majority or care about popularity. He speaks the truth because he knows firsthand. He’s been on the streets working with our homeless citizens for more years than I can count. He volunteers at overflow — he’s done far more for the homeless community than any other leader on the Central Coast. Please educate yourself. Please think long and hard about spending such an exorbitant amount of (soft) money on a holding pen – because that is exactly what it is. Go look at Prado today. Then go look in a year. Same faces. Sad faces. Becky, you should chair the Homeless Services Oversight Council! Enabling unrestricted access for People’s Kitchen to serve a noontime meal to all who are hungry cannot be overemphasized. Would you believe the well paid staff members even partake? This regularly raises eyebrows. In addition, I invite those who are denied to picket Capslo in their barring of the noontime meals and basic services such as receiving a daily shower. So be it if some or all groups discontinue their services. Capslo exploits the complimentary food services of People’s Kitchen and should instead cook and serve their own meals in-house. PK just cannot serve all who are hungry as long as they continue to serve under Capslo’s roof. Shame on them. In my interaction with the local homeless people in my area it is obvious that most have some degree of mental illness or drug/alcohol abuse or both. Some might be helped with psychiatric care but only if they comply with their meds and cooperate with their doctors. Something that is very rare. Some might be helped with drug and alcohol rehab programs. But, the truth is that most of these people will never be able to care for themselves or support themselves. Many could qualify for Social Security disability payments (SSI) or VA benefits if they had some fixed address. I don’t believe that people want to have the money necessary to take care of these people taken out of their pockets. It will cost millions per year. Most do struggle with mental illness, some with drug and or alcohol addiction(s), some both, with that being said how can we expect them to comply with anything outside of what drives them? We need to challenge ourselves to revisit the idea that since “we” can do something that is “normal”, or we can “comply”, then all can and should. We cannot, should not, put our “normal” expectations on those we deem as not being “normal”, it isn’t realistic and keeps US stuck in our prejudices. It doesn’t take a “fixed address” to qualify for or receive the benefits you speak of. What it does take is fortitude. I saw the hell that a close friend of mine went through getting his Social Security Disability Benefits, it took 5 years to get benefits he had worked for and both sides (his doctors and the SSA doctors) said he needed. It’s a war of attrition, one that the SSA is much better set up to win then a homeless individual. If this center does in fact bring all these resources together, Social Services, Mental Health, etc., and they can function as cohesive entities, autonomous from CAPSLO while cohabiting with them, then it should bear some fruit. It should also incorporate something along the lines of the One-Stop Center on Industrial. I know you Becky, you know me. We’ve spent time on the phone, I’ve participated in meetings at the Salvation Army with your board and members of the homeless community. I know your drive, your commitment and where your heart resides in all of this; if there is one true advocate for these disadvantaged individuals it is you. But…. Isn’t this new shelter/center a forgone conclusion? This is gonna happen, right? Land for this center is in the escrow process right now, correct? That fact alone should tell us all there is no more hurdles for CAPSLO to jump over, or through, to get this done, correct? Unless you and others expect the BOS to do a complete reversal of their usual CAPSLO first and only stand on everything homeless, it’s a done deal, right? With that in mind, and without any suggestion that your efforts should diminish in energy or scope with Hope’s Village, shouldn’t we now make a concerted effort to make this shelter/center into what it’s suppose to be, a place where the homeless come to get the services they need to eventually get them in permanent housing? If CAPSLO says that’s their intended goal, and since their track record hasn’t shown that to be true to date, isn’t it in everyone’s best interest to better hold these folks accountable? Can’t we start there first? Then work our way forward from there? I have never met Ms. Jorgesen, but I have the utmost respect for this wonderful Lady! IT is a well known FACT: Other counties, (even Vegas) send their homeless with one way bus tickets. Can you imagine what will happen if they build this “Utopia” big shelter in SLO? I am amazed they are considering adding to an already misguided system. NOT that I have the answers, but putting the mentally ill in temp shelters is def not the answer! Constant punishments and daily wandering around the city criminalizes those we should be protecting. This “village” Ms. Jorgesen speaks of is the best solution I have heard yet! Allow them a home and their dignity. You have truly raised valid points. As has another person elsewhere about the zoning and regulations (not to mention NIMBYism) that make the Hope’s Village concept be so difficult to realize. CAPSLO has recently changed many of its policies–let’s see how they do with drug/alcohol/case management changes that are planned. I’m impressed by the very thoughtful way you’ve posed each VALID question to the status quo folks attempting to push home the need for this massive and very superfluous money pit shelter. They speak of the “10 Year Plan” well that was 6 years ago and it has not been adopted, you wonder why? Because they would then be held accountable for meeting the goals set forth in that “10 Year Plan”. I would further ask that CAPSLO show proof that their existing program works. I for one would like to see examples and hard facts of folks that have been in case management and transitioned into housing. Unfortunately, I feel very strongly that what would be presented, if at all would be shocking to the citizens of SLO that have been fooled into believing that CAPSLO is helping anyone. 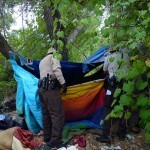 Until this happens NO funding should be allocated to CAPSLO’s homeless services. Our City and County Government is riddled with folks that only want to throw money at failing programs and turn a blind eye to the community that has valid concerns and even well thought out proposals to address this growing issue. This is a very complex issue that cannot be solved with building a massive shelter. A core process needs to be developed so each person can be treated as an individual based on their unique situation. I see no proof that the current process does this. On a side note: look at measure “Y”, it was initiated to provide capital improvement projects for SLO. Did it? NOPE! It went to higher salaries and new city employees. My point is this, the honesty and integrity of this City and County’s leadership to act in the best interest of the citizens of the City and County is dishonest and self-serving at best. What does this post have to do with the article? Zip. Mr. Gibson, along with Mr. Hill have helped funnel millions of taxpayer’s dollars down the bottomless pit that is CAPSLO for one. Time for Mr. Gibson to go, along with the female version of Mr. Hill, Ms. Ray. For the health of the taxpayers of SLO county both need to go.